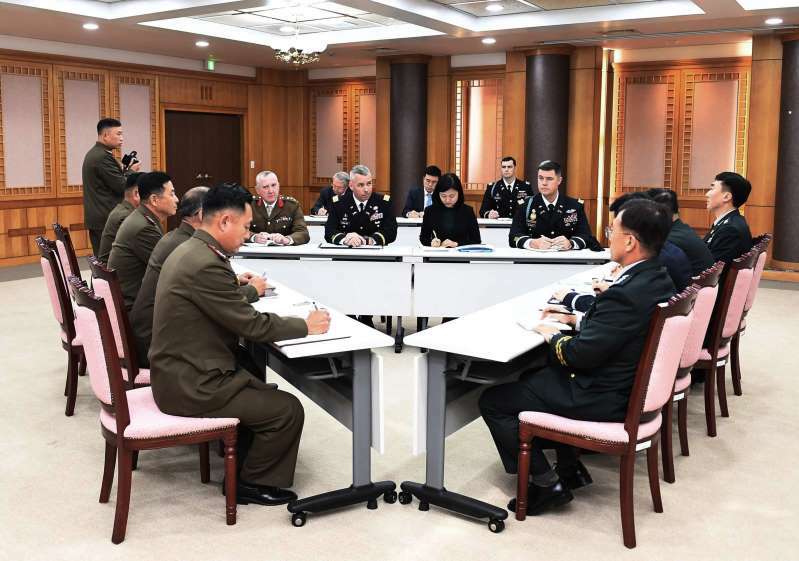 Military officers from the two Koreas and the U.S.-led U.N. Command met again at the Koreas' border village Monday to examine an ongoing effort to disarm the area. Demetallizing the Panmunjom village inside the Koreas' heavily fortified border was among many agreements the Koreas struck in September to lower military tensions between the rivals. Under the deals, troops from the Koreas began clearing mines from Panmunjom earlier this month before withdrawing weapons and guard posts there. They eventually plan to have 35 unarmed personnel from each side guard the village. Monday's trilateral talks are the second in kind in about a week. Officially, the village is jointly overseen by North Korea and the U.N. Command, a legacy of the 1950-53 Korean War that ended with an armistice, not a peace treaty. The talks are to review the demining work and discussing future steps in the area, South Korea's Defense Ministry said in a statement. As part of the September agreements, the two Koreas are removing mines from another frontline area where they plan their first-ever joint searches for the remains of soldiers killed during the Korean War. The Koreas also plan to establish buffer zones along their land and sea boundaries, and a no-fly zone above the border. General-level officers from the Koreas are to meet at Panmunjom on Friday to discuss more details about how to implement the tension-reduction deals, according to the South Korean Defense Ministry. Also Monday, officials from the Koreas separately met at their recently launched liaison office at the North Korean border town of Kaesong for talks on how to cooperate in forestry sectors. Seoul's liberal government is pushing for greater engagement with North Korea, but U.S. officials say such moves should be in tandem with global efforts to denuclearize North Korea.